Art Deco platinum engagement ring with 1.55 ct white diamond and Brazilian emeralds: Description by Adin Antique Jewelry. 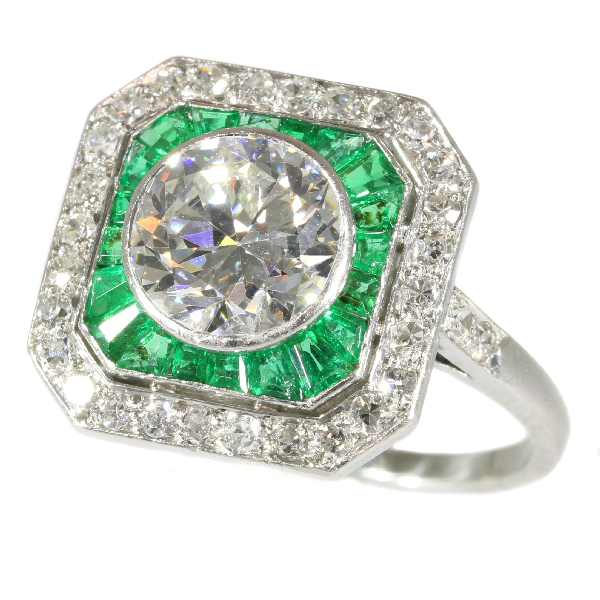 This splendid platinum Art Deco ring radiates straight to your heart; from a 1.55 ct old European cut diamond centre over an octagonal shaped framed set with emeralds and diamonds. As 20 Brazilian emeralds emphasize the impeccable white colour of the grand dazzling diamond, this ring symbolizes the uncharted possibilities for the first unwritten blank pages of a new unspoiled path in love. The outer set of 28 single cut diamonds surrounding the stunning centre bedecks even the ring's shank so it can sweep softly around your finger. Diamond(s): One old European cut diamond with an estimated weight of 1.55ct. (colour and clarity: E/F, si). 28 single brilliant cut diamonds (also called 8/8) with an estimated weight of ± 0.42ct. (colour and clarity: G/J, vs/si). Total diamond count: 29 pcs. Total diamond weight: approx. 1.92 crt.